EverQuest is a 3D fantasy-themed massively multiplayer online role-playing game (MMORPG) originally developed by Verant Interactive and 989 Studios for Windows PCs. It was released by Sony Online Entertainment in March 1999 in North America, and by Ubisoft in Europe in April 2000. A dedicated version for macOS was released in June 2003, which operated for ten years before being shut down in November 2013. In June 2000, Verant Interactive was absorbed into Sony Online Entertainment, who took over full development and publishing duties of the title. Later, in February 2015, SOE's parent corporation, Sony Computer Entertainment, sold the studio to investment company Inception Acquisitions and was rebranded as Daybreak Game Company, who develops and publishes EverQuest to this day. It was the first commercially successful MMORPG to employ a 3D game engine, and its success was on an unprecedented scale. EverQuest has had a wide influence on subsequent releases within the market, and holds a very important position in the history of massively multiplayer online games. The game surpassed early subscription expectations and increased in popularity for many years after its release. It has received numerous awards, including the 1999 GameSpot Game of the Year and a 2007 Technology & Engineering Emmy Award. While dozens of similar games have come and gone over the years, EverQuest still endures as a viable commercial enterprise with new expansions still being released on a regular basis, almost twenty years after its initial launch. It has spawned a number of spin-off media, including books and video games, as well a sequel, EverQuest II, which launched in 2004. Many of the elements in EverQuest have been drawn from text-based MUD (Multi-User Dungeon) games, particularly DikuMUDs, which in turn were inspired by traditional role-playing games such as Dungeons & Dragons. In EverQuest, players create a character (also known as an avatar, or colloquially as a char or toon) by selecting one of twelve races in the game, which were humans, high-elves, wood-elves, half-elves, dark-elves, erudites, barbarians, dwarves, halflings, gnomes, ogres, and trolls. In the first expansion, lizard-people (Iksar) were introduced. Cat-people (Vah Shir), frog-people (Froglok), and dragon-people (Drakkin) were all introduced in later expansions. At creation, players select each character's adventuring occupation (such as a wizard, ranger, or cleric — called a class — see below for particulars), a patron deity, and starting city. Customization of the character facial appearance is available at creation (hair, hair color, face style, facial hair, facial hair color, eye color, etc.). A Sand Giant engaging a group in the Oasis of Marr, a desert zone. The low-polygon character models, low resolution, and simple user interface suggest this screenshot was taken between 1999 and 2002. Players move their character throughout the medieval fantasy world of Norrath, often fighting monsters and enemies for treasure and experience points, and optionally mastering trade skills. As they progress, players advance in level, gaining power, prestige, spells, and abilities through valorous deeds such as entering overrun castles and keeps, defeating worthy opponents found within, and looting their remains. Experience and prestigious equipment can also be obtained by completing quests given out by non-player characters found throughout the land. EverQuest allows players to interact with other people through role-play, joining player guilds, and dueling other players (in restricted situations – EverQuest only allows player versus player (PVP) combat on the PvP-specific server, specified arena zones and through agreed upon dueling). The game-world of EverQuest consists of over five hundred zones. Multiple instances of the world exist on various servers. In the past, game server populations were visible during log-in, and showed peaks of more than 3000 players per server. The design of EverQuest, like other massively multiplayer online role-playing games, makes it highly amenable to cooperative play, with each player having a specific role within a given group. EverQuest featured fourteen playable character classes upon release in 1999, with two others - Beastlord and Berzerker - added in the Shadows of Luclin (2001) and Gates of Discord (2004) expansions, respectively. Each class falls within one of four general categories based on playstyle and the type of abilities they use, with certain classes being restricted to particular races. Melee classes are those which fight at close quarters and often use direct physical attacks as opposed to magic. These include the Warrior, a tank-based character which wears heavy armor and is designed to take damage for its group using a taunt ability; the Monk, a character which uses a combination of martial arts and barehanded fighting techniques; the Rogue, a combination thief/assassin class which can sneak and hide in the shadows as well as steal from enemies; and the Berserker, a strong fighter who specialize in two-handed weapons such as axes and are able to enter a state of increased fury and power. Priest classes are primarily healers who learn magic that can mend the wounds of their allies or themselves. The Priest classes are made up of the Cleric, a heavily specialized support class that wears heavy armor and is adept at healing and strengthening their allies; the Druid, a magic-user who draws power from nature which can restore the vitality and magic power of their teammates; and the Shaman, tribal warriors who draw upon the spirit realm to heal, empower those around them, and weaken their enemies. Casters are magic-users and sorcerers which wear light armor but command powerful spells. Those among them include the Wizard, a specialized damage-dealing class which uses the power of fire, ice, and pure magic energy for devastating effect as well as teleportation abilities; the Magician, a summoner who is able to call upon elemental servants which aid them in dealing damage; the Necromancer, a dark caster who uses the power of disease and poison to wither away their opponents while commanding undead allies to aid them; and the Enchanter, an illusionist who can take on many forms, support allies with strengthening spells, and pacify enemies with mesmerizing abilities. Hybrid classes are those which can perform multiple roles or have abilities of various types. These include Paladins, knights who possess the ability to take damage or heal with magic or laying on of hands; Shadowknights, dark warriors who use a combination of melee attacks and disease/poison abilities to damage foes as well as take damage for the party; the Bard, a minstrel who is able to use magical songs for a number of effects - including damaging enemies, strengthening allies, and improving the movement speed of themselves and others; Rangers, protectors of nature who learn healing and support magic in addition to being able to damage enemies in close combat or at a distance with bows and arrows; and Beastlords, primal fighters who are constantly joined by their animal wards which help them deal damage, and can assist their teammates with healing and support skills. There are several deities in EverQuest who each have a certain area of responsibility and play a role in the backstory of the game setting. A wide array of armor and weapons are also deity-tied, making it possible for only those who worship that deity to wear/equip them. Additionally, deities determine, to some extent, where characters may and may not go without being attacked on sight by the deity's minions and devoted followers. The EverQuest universe is divided into more than five hundred zones. These zones represent a wide variety of geographical features, including plains, oceans, cities, deserts, and other planes of existence. One of the most popular zones in the game is the Plane of Knowledge, one of the few zones in which all races and classes can coexist harmoniously without interference. The Plane of Knowledge is also home to portals to many other zones, including portals to other planes and to the outskirts of nearly every starting city. 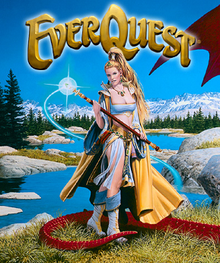 EverQuest began as a concept by John Smedley in 1996. The original design is credited to Brad McQuaid, Steve Clover, and Bill Trost. It was developed by Sony's 989 Studios and its early-1999 spin-off Verant Interactive, and published by Sony Online Entertainment (SOE). Since its acquisition of Verant in late 1999, EverQuest was developed by Sony Online Entertainment. The design and concept of EverQuest is heavily indebted to text-based MUDs, in particular DikuMUD, and as such EverQuest is considered a 3D evolution of the text MUD genre like some of the MMOs that preceded it, such as Meridian 59 and The Realm Online. John Smedley, Brad McQuaid, Steve Clover and Bill Trost, who jointly are credited with creating the world of EverQuest, have repeatedly pointed to their shared experiences playing MUDs such as Sojourn and TorilMUD as the inspiration for the game. Famed book cover illustrator Keith Parkinson created the box covers for earlier installments of EverQuest. Development of EverQuest began in 1996 when Sony Interactive Studios America (SISA) executive John Smedley secured funding for a 3D game like text-based MUDs following the successful launch of Meridian 59 the previous year. To implement the design, Smedley hired programmers Brad McQuaid and Steve Clover, who had come to Smedley's attention through their work on the single player RPG Warwizard. McQuaid soon rose through the ranks to become executive producer for the EverQuest franchise and emerged during development of EverQuest as a popular figure among the fan community through his in-game avatar, Aradune. Other key members of the development team included Bill Trost, who created the history, lore and major characters of Norrath (including EverQuest protagonist Firiona Vie), Geoffrey "GZ" Zatkin, who implemented the spell system, and artist Milo D. Cooper, who did the original character modeling in the game. The start of beta testing was announced by Brad McQuaid in November 1997. EverQuest launched with modest expectations from Sony on 16 March 1999 under its Verant Interactive brand and quickly became successful. By the end of the year, it had surpassed competitor Ultima Online in number of subscriptions. Numbers continued rising rapidly until mid-2001 when growth slowed. The game initially launched with volunteer "Guides" who would act as basic customer service/support via 'petitions'. Issues could be forwarded to the Game Master assigned to the server or resolved by the volunteer. Other guides would serve in administrative functions within the program or assisting the Quest Troupe with dynamic and persistent live events throughout the individual servers. Volunteers were compensated with free subscription and expansions to the game. In 2003 the program changed for the volunteer guides taking them away from the customer service focus and placing them into their current roles as roving 'persistent characters' role-playing with the players. In anticipation of PlayStation's launch, Sony Interactive Studios America made the decision to focus primarily on console titles under the banner 989 Studios, while spinning off its sole computer title, EverQuest, which was ready to launch, to a new computer game division named Redeye (renamed Verant Interactive). Executives initially had very low expectations for EverQuest, but in 2000, following the surprising continued success and unparalleled profits of EverQuest, Sony reorganized Verant Interactive into Sony Online Entertainment (SOE) with Smedley retaining control of the company. Many of the original EverQuest team, including Brad McQuaid and Steve Clover left SOE by 2002. The first four expansions were released in traditional physical boxes at roughly one-year intervals. These were highly ambitious and offered huge new landmasses, new playable races and new classes. The expansion Shadows of Luclin (2001) gave a significant facelift to player character models, bringing the by-then dated 1999 graphics up to modern standards. However, non-player characters which do not correspond to any playable race-gender-class combination (such as vendors) were not updated, leading to the coexistence of 1999-era and 2001-era graphics in many locations. The expansion Planes of Power (2002) introduced The Plane of Knowledge, a hub zone from which players could quickly teleport to many other destinations. This made the pre-existing roads and ships largely redundant, and long-distance overland travel is now virtually unheard of. EverQuest made a push to enter the European market in 2002 with the New Dawn promotional campaign, which not only established local servers in Germany, France and Great Britain but also offered localized versions of the game in German and French to accommodate players who prefer those languages to English. In the following year the game also moved beyond the PC market with a Mac OS X version. In 2003 experiments began with digital distribution of expansions, starting with the Legacy of Ykesha. From this point on expansions would be less ambitious in scope than the original four, but on the other hand the production rate increased to two expansions a year instead of one. This year the franchise also ventured into the console market with EverQuest Online Adventures, released for Sony's internet-capable PlayStation 2. It was the second MMORPG for this console, after Final Fantasy XI. Story-wise it was a prequel, with the events taking place 500 years before the original EverQuest. Other spin-off projects were the PC strategy game Lords of EverQuest (2003) and the co-op Champions of Norrath (2004) for the PlayStation 2. After these side projects, the first proper sequel was released in late 2004, titled simply EverQuest II . The game is set 500 years after the original. EverQuest II faced severe competition from Blizzard's World of Warcraft, which was released at virtually the same time and quickly grew to dominate the MMORPG genre. Since the release of World of Warcraft and other modern MMORPGs, there have been a number of signs that the EverQuest population is shrinking. The national New Dawn servers were discontinued in 2005 and merged into a general (English-language) European server. The 2006 expansion The Serpent's Spine introduced the "adventure-friendly" city of Crescent Reach in which all races and classes are able (and encouraged) to start. Crescent Reach is supposed to provide a more pedagogic starting environment than the original 1999 cities, where players were given almost no guidance on what to do. The common starting city also concentrates the dwindling number of new players in a single location, making grouping easier. 2008's Seeds of Destruction expansion introduced computer controlled companions called "mercenaries" that can join groups in place of human players; a response to the increasing difficulty of finding other players of appropriate level for group activities. As of Seeds the production rate also returned to one expansion a year instead of two. In March 2012 EverQuest departed from the traditional monthly subscription business model by introducing three tiers of commitment: a completely free-to-play Bronze Level, a one-time fee Silver Level, and a subscription Gold Level. The same month saw the closure of EverQuest Online Adventures. Just a few months earlier EverQuest II had gone free-to-play and SOE flagship Star Wars Galaxies also closed. In June of the same year SOE removed the ability to buy game subscription time with Station Cash without any warning to players. SOE apologized for this abrupt change in policy and reinstated the option for an additional week, after which it was removed permanently. November 2013 saw the closure of the sole Mac OS server Al'Kabor. In February 2015 Sony sold its online entertainment division to private equity group Columbus Nova, with Sony Online Entertainment subsequently renamed Daybreak Game Company (DBG). An initial period of uncertainty followed, with all projects such as expansions and sequels put on hold and staff laid off. The situation stabilized around the game's 16th anniversary celebrations, and a new expansion was released in November 2015. The game runs on multiple game servers, each with a unique name for identification. These names were originally the deities of the world of Norrath. In technical terms, each game server is actually a cluster of server machines. Once a character is created, it can be played only on that server unless the character is transferred to a new server by the customer service staff, generally for a fee. Each server often has a unique community and people often include the server name when identifying their character outside of the game. SOE devoted one server (Al'Kabor) to an OS X version of the game, which opened for beta testing in early 2003, and officially released on June 24, 2003. The game was never developed beyond the Planes of Power expansion, and contained multiple features and bugs not seen on PC servers, as a side-effect of the codebase having been split from an early Planes of Power date but not updated with the PC codebase. In January 2012, SOE announced plans to shut down the server, but based on the passionate response of the player base, rescinded the decision and changed Al'Kabor to a free-to-play subscription model. At about the same time, SOE revised the Macintosh client software to run natively on Intel processors. Players running on older, PowerPC-based systems lost access to the game at that point. Finally in November 2013, SOE closed Al'Kabor. Two SOE servers were set up to better support players in and around Europe: Antonius Bayle and Kane Bayle. Kane Bayle was merged into Antonius Bayle. With the advent of the New Dawn promotion, three additional servers were set up and maintained by Ubisoft: Venril Sathir (British), Sebilis (French) and Kael Drakkal (German). The downside of the servers was that while it was possible to transfer to them, it was impossible to transfer off. The servers were subsequently acquired by SOE and all three were merged into Antonius Bayle server. Reviews of Everquest were mostly positive upon release in 1999, earning an 85 out of 100 score from aggregate review website Metacritic. Comparing it to other online role-playing titles at the time, critics called it "the best game in its class," and the "most immersive and most addictive online RPG to date." Dan Amrich of GamePro magazine declared that "the bar for online gaming has not so much been raised as obliterated," and that the game's developers had "created the first true online killer app." The reviewer would find fault with its repetitive gameplay in the early levels and lack of sufficient documentation to help new players, urging them to turn to fansites for help instead. Greg Kasavin of GameSpot similarly felt that the game's combat was "uninteresting" but did note that, unlike earlier games in the genre, EverQuest offered the opportunity to play on servers that wouldn't allow players to fight each other unless they chose to, and that it heavily promoted cooperation. Ultimately, the reviewer would declare that "the combat may be a little boring, the manual may be horrible, the quest system half-baked, and the game not without its small share of miscellaneous bugs. But all you need is to find a like-minded adventurer or two, and all of a sudden EverQuest stands to become one of the most memorable gaming experiences you've ever had." Baldric of Game Revolution likewise stated that the game was more co-operative than Ultima Online, but that there was less interaction with the environment, calling it more "player oriented" instead of "'world' oriented." Despite server issues during the initial launch, reviewers felt that the game played well even on lower-end network cards, with Tal Blevins of IGN remarking that it "rarely suffered from major lag issues, even on a 28.8k modem." The reviewer did feel that the title suffered from a lack of player customization aside from different face types, meaning all characters of the same race looked mostly the same, but its visual quality on the whole was "excellent" with "particularly impressive" spell, lighting, and particle effects. Computer Games Magazine would also commend the game's three-dimensional graphics and environments, remarking that "With its 3D graphics, first-person perspective, and elegantly simple combat system, EverQuest has finally given us the first step towards a true virtual world. Internet gaming will never be the same." Everquest was named GameSpot's 1999 Game of the Year in its Best & Worst of 1999 awards, remarking that "Following EverQuest's release in March, the whole gaming industry effectively ground to a halt [...] At least one prominent game developer blamed EverQuest for product delays, and for several weeks GameSpot's editors were spending more time exploring Norrath than they were doing their jobs." The website would also include the game in their list of the Greatest Games of All Time in 2004. GameSpot UK would also rank the title 14th on its list of the 100 Best Computer Games of the Millennium in 2000, calling it "a technological tour de force" and "the first online RPG to bring the production values of single-player games to the online masses." The Academy of Interactive Arts and Sciences named EverQuest their Online Game of the Year for 1999, while Game Revolution named it the Best PC RPG of 1999. It was included in Time magazine's Best of 1999 in the "Tech" category, and Entertainment Weekly would include the game in their Top Ten Hall of Fame Video Games of the '90s, calling its virtual world "the nearest you could get to being on a Star Trek holodeck." In 2007, Sony Online Entertainment received a Technology & Engineering Emmy Award for EverQuest under the category of "Development of Massively Multiplayer Online Graphical Role Playing Games". During the 2nd annual Game Developers Choice Online Awards in 2011, EverQuest received a Hall of Fame award for its long-term advancement of online gaming, such as being the first MMORPG to feature a guild system and raiding. Editors of Computer Gaming World and GameSpot each nominated EverQuest for their 1999 "Role-Playing Game of the Year" awards, both of which ultimately went to Planescape: Torment. CNET Gamecenter likewise nominated it in this category, but gave the award to Asheron's Call. GameSpot would also nominate the title for Best Multiplayer Game of 1999, but would give the award to Quake III Arena. In 2012, 1UP.com ranked EverQuest 57th on its list of the Top 100 Essential Games. EverQuest was the most pre-ordered PC title on EBGames.com prior to its release in March 1999. The game had 10,000 active subscribers 24 hours after launch, making it the high-selling online role-playing game up until that point. It achieved 60,000 subscribers by April 1999. Six months later, around 225,000 copies of the game had been sold in total, with 150,000 active subscribers. By early 2000, the game's domestic sales alone reached 231,093 copies, which drew revenues of $10.6 million. Subscription numbers would rise to over 500,000 active accounts four years after release in 2003. By the end of 2004 the title's lifetime sales exceeded 3 million copies worldwide and reached an active subscriber peak of 550,000. The sale of in-game objects for real currency is a controversial and lucrative industry with topics concerning issues practices of hacking/stealing accounts for profit. Critics often cite how it affects the virtual economy inside the game. In 2001, the sales of in-game items for real life currency was banned on eBay. A practice in the real-world trade economy is of companies creating characters, powerleveling them to make them powerful, and then reselling the characters for large sums of money or in-game items of other games. Sony discourages the payment of real-world money for online goods, except on certain "Station Exchange" servers in EverQuest II, launched in July 2005. The program facilitates buying in-game items for real money from fellow players for a nominal fee. At this point this system only applies to select EverQuest II servers; none of the pre-Station Exchange EverQuest II or EverQuest servers are affected. In 2012, Sony added an in-game item called a "Krono", which adds 30 days of game membership throughout EverQuest and EverQuest II. The item can be initially bought starting at US$17.99. Up to 25 "Kronos" can be bought for US$424.99. Krono can be resold via player trading, which has allowed Krono to be frequently used in the real-world trade economy. On October 2000, Verant banned a player by the name of Mystere, allegedly for creating controversial fan fiction, causing outrage among some EverQuest players and sparking a debate about players' rights and the line between roleplaying and intellectual property infringement. The case was used by several academics in discussing such rights in the digital age. Some argue the game has addictive qualities. Many players refer to it as "EverCrack" (a comparison to crack cocaine). There was one well-publicized suicide of an EverQuest user named Shawn Woolley, that inspired his mother, Liz, to found Online Gamers Anonymous. Massively multiplayer online role-playing games (MMORPGs) are described by some players as "chat rooms with a graphical interface". The sociological aspects of EverQuest (and other MMORPGs) are explored in a series of online studies on a site known as "the HUB". The studies make use of data gathered from player surveys and discuss topics like virtual relationships, player personalities, gender issues, and more. In May 2004, Woody Hearn of GU Comics called for all EverQuest gamers to boycott the Omens of War expansion in an effort to force SOE to address existing issues with the game rather than release another "quick-fire" expansion. The call to boycott was rescinded after SOE held a summit to address player concerns, improve (internal and external) communication, and correct specific issues within the game. On 17 January 2008, the Judge of the 17th Federal Court of Minas Gerais State forbade the sales of the game in that Brazilian territory. The reason was that "the game leads the players to a loss of moral virtue and takes them into "heavy" psychological conflicts because of the game quests". EverQuest Role-Playing Game (a role-playing game produced in collaboration with White Wolf which uses the d20 system). Legends of Norrath (a virtual card game which launched sometime in 2007 or early 2008 which also awards EverQuest and EverQuest II players with in-game items). This page is based on the Wikipedia article EverQuest; it is used under the Creative Commons Attribution-ShareAlike 3.0 Unported License (CC-BY-SA). You may redistribute it, verbatim or modified, providing that you comply with the terms of the CC-BY-SA.